A RAVENSHOE shop owner has described seeing a man’s skin melting as he fled for his life from a cafe after a gas explosion. Ravenshoe Highland Bakery owner Edgar Grigg was one of the first on the scene when the Serves You Right cafe, next door to his bakery, exploded just after midday yesterday. He said he watched elderly people and Queensland Fire and Rescue personnel run from the building after a vehicle crashed into its side, causing the explosion. Mr Grigg said the man who delivers the milk to the bakery was at the back of the shop when the explosion happened. “He was out at his truck and it blew him off his feet,” he said. Ravenshoe resident Steve Madsen was in front of the bakery when he saw the vehicle jump the gutter. “I was going down to have a look,” he said. Mr Madsen said the explosion caused him to duck and fall backwards. “I never got burnt, but I was pretty close,” he said. “People came running out and they were all burnt and their clothes were on fire.” Mr Madsen said people who were uninjured tried to help, running to get hoses and pouring water on the burns victims. Another witness has described scenes as “absolute mayhem”. The Octupi Garden employee Star West said she saw the vehicle revving up across the road from the cafe. “For some reason it took a 90 degree bend straight into the back of Serves You Right,” she said. “Initially we thought it was the bakery. That’s when I rang 000.” Ms West said the explosion happened immediately. 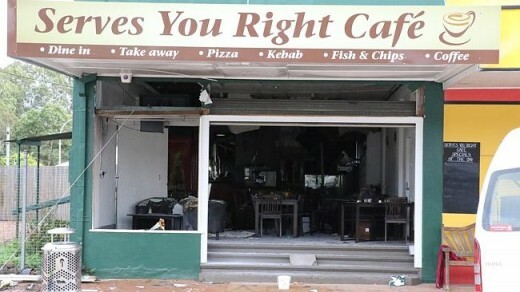 “While I was on the phone to 000 the flames were already coming out of the front of Serves You Right,” she said.